Here you can watch the eagles soaring over head and many times landing on the near by trees. Our waterfront home has an open concept with magnificent water and Mt. Baker views. It is nestled in the woods giving it the privacy needed for a peaceful vacation. The main level has a living room with cathedral ceilings and floor to ceiling windows which flood the home with light and bring the outside in. There is also a massive rock fireplace perfect for cozy intimate evenings. The kitchen is large enough for multiple cooks and the breakfast bar seating is perfect for the 'kibitzers'. There is a den that can be closed off to serve as another bedroom. In addition there is a bath with shower and a guest half bath. On the upper level is a very large master suite with en suite bath, jetted tub, separate shower and double sinks. The Master Bedroom has a new King Size Bed. There are 2 additional bedrooms with Queen Size Beds and another full bath. The main level has another bedroom with day bed and trundle or you can use the Queen sleeper sofa. The full bath is adjacent. There is a large deck with a portion of it covered. Lovely view of Mt. Baker and the Canadian Mtns. Large Living Room with 2 sofas, and 3 easy chairs. Fully Stocked with all necessary dishes, pots & pans, utensils, baking pans, etc. Bike rentals are available on first come basis. The home has a generator to take care of any unseen forces of nature. Despite the fact that this house is a mere 11 miles as the crow flies from my home, a short drive and ferry ride made it feel a world away! Beautiful home, lovely setting, easy beach access and eagles flying by — oh my! I know my family will be back. There aren’t many properties in this neck of the woods that are beachfront, have four bedrooms and allow dogs. I am so glad you enjoyed your time. Yes, it is a spot to watch the eagles, enjoy the view, walk the beach and just relax. We had a lovely stay at Eagles Rest. Warm welcoming atmosphere. Well equipped and stocked kitchen. We had a wonderful weekend! 6-8 of us from our women's group. Comfortable beds, friendly kitchen, comfy living room. The setting is exquisite. Very helpful and understanding manager. Thank you Virginia! Each year for the last 5 years we as siblings/spouses get together for a long weekend. We pick different homes in Washington/Oregon/B.C. This was one of our favorites. We had beautiful weather so we sat out on the deck quite a bit enjoying the view of the water and of Mount Baker. House had everything we needed except there were no locks on the bathroom doors which was kind of strange. I would recommend this house to anyone who would like a relaxing time in a beautiful clean view home. Beautiful view of Mt Baker in a spotless cozy home!! House was spotless and more than enough amenities. Beds were super comfy! Communication was super easy! We would definitely stay again! I stayed at Eagle's Rest for 6 nights with my sisters and my 2 dogs in April, 2017. 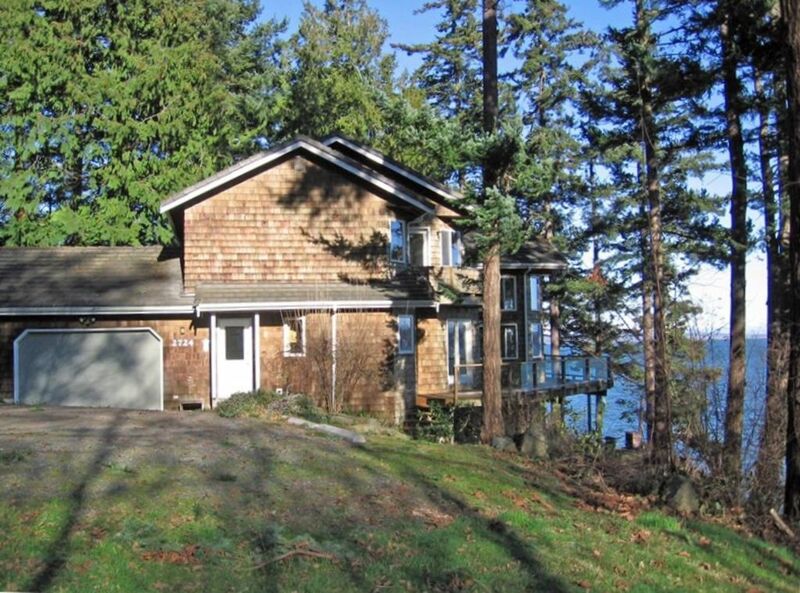 It is a lovely, private, comfortable home with wonderful views of the water and the cascades. The large kitchen is well equipped. The beach is easy to access and increases in length dramatically at low tide. We explored the northern portion of Lummi Island along the road and on park trails. Saw eagles everyday. The ferry was convenient. The Beach Store Cafe had excellent food and a fun trivia game on Monday night. Very relaxing trip. There are several very nice walking trails and one good hiking trail. Bikes are available to rent. Book early as the supply is limited. There is a Kayak Company that will come to the island and also a boat company that will pick you up right on your beach. There are 2 wine tasting rooms on the island. Memorial Day and Labor Day weekends there is an artists tour.